Creating a road map to strong community after a natural disaster. Natural disasters can happen any time. The five counties that make up the Portland Metropolitan Region are working together to develop a framework to guide rebuilding, redevelopment, and recovery efforts in the weeks, months, and years after the disaster. The goal is to seize the opportunity to creatively re-design our region to be even stronger and more resilient for the future. This project is a collaboration between public, private, and nonprofit sector stakeholders. It is led by the five-county, multi-state Regional Disaster Preparedness Organization (RDPO). 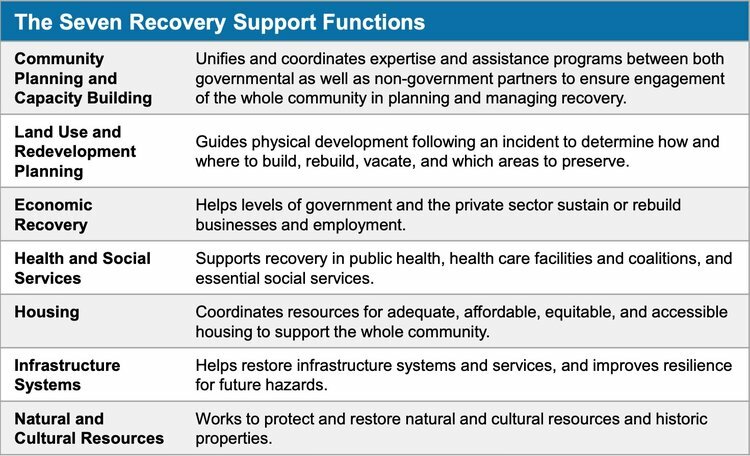 The Portland Regional Recovery Framework will incorporate seven Recovery Support Functions (RSFs). RSFs support local governments by facilitating problem solving, improving access to resources, and fostering coordination among agencies, non-governmental partners, and community stakeholders. The Community Planning and Capacity Building RSF focuses on helping a community(ies) and their agencies and organizations by planning for both before and after disasters through coordination of support, capacities, and resources available. Visit FEMA’s Community Planning and Capacity Building site for a list of partners involved in federal CPCB work. Support land use efforts through the coordination with other RSFs. It is important to note that Land Use and Redevelopment Planning does not form one of the six Federal RSFs outlined in the National Disaster Recovery Framework (NDRF). Based on needs identified in each county and in the RDPO 2017-2023 Strategic Plan, the addition of this RSF is an essential aspect of recovery for the Portland Region. 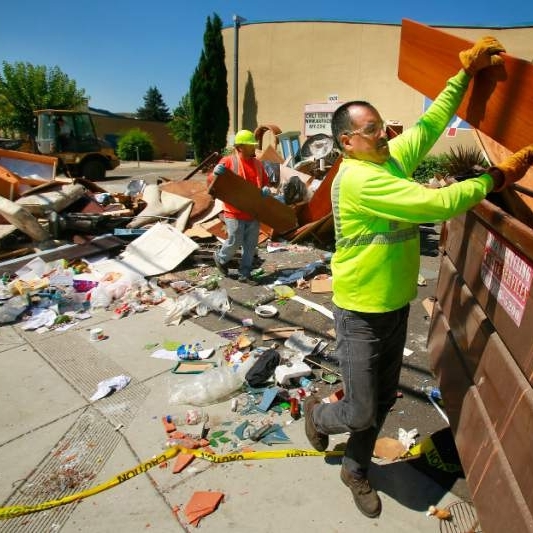 Read about how Boulder, Colorado and the City of Seattle have incorporated similar RSFs into recovery planning related to land use and redevelopment. The Economic RSF focuses on the ability of the economy to return to a state of normalcy following a disaster to ensure employment and economic development within the community. Economic Recovery RSF, "integrates the expertise of the Federal Government to help local, regional/metropolitan, state, tribal, territorial, and insular area governments and the private sector sustain and/or rebuild businesses and employment and develop economic opportunities that result in sustainable and economically resilient communities after an incident." Visit FEMA’s Economic RSF page for more info. One of the seven RSFs included for the Portland Metropolitan Regional Recovery Framework is Health and Social Services. The Health and Social Services RSF outlines the framework to support locally led recovery efforts to address public health, health care facilities and coalitions, and essential social services needs. Displaced individuals in need of housing will also need health and social services support. Visit FEMA’s Federal Health and Social Services RSF page for more info. Housing coordinates and facilitates the delivery of local, state, and/or federal resources to implement housing solutions that effectively support the needs of the whole community and contribute to its sustainability and resilience. Housing as a component of disaster recovery must be adequate, affordable, and accessible to make a difference for the whole community. View FEMA’s Housing RSF page for more info. The Infrastructure Systems RSF works "to efficiently facilitate the restoration of infrastructure systems and services to support a viable, sustainable community and improves resilience to and protection from future hazards." View FEMA’s Infrastructure Systems RSF page for more info. Natural and Cultural Resources focuses on the response and recovery capabilities required to aid in the protection of resources, both natural and cultural. Further, the response and recovery goals that can be implemented to "preserve, conserve, rehabilitate, and restore them consistent with post-disaster community priorities and in compliance with applicable environmental and historical preservation laws." Visit FEMA’s Natural and Cultural Resources RSF page for more info and to see a list of stakeholders to involve in planning. 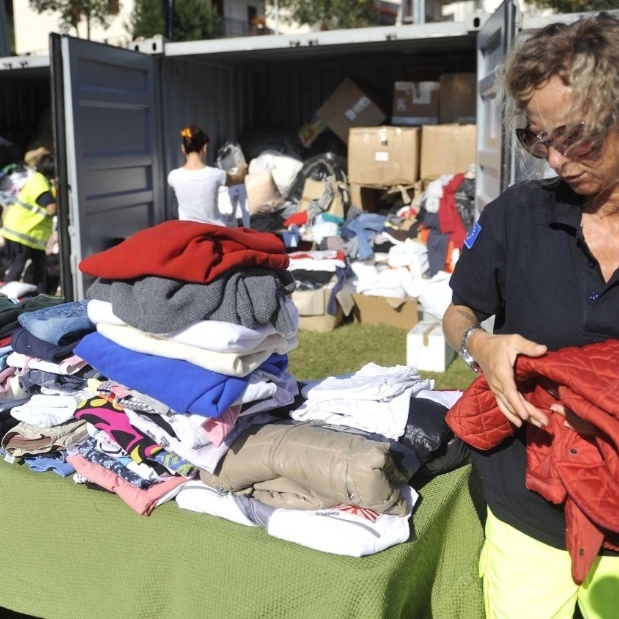 The aim of recovery is to restore a community to its previous state - or better. It only succeeds if the whole community is involved in planning, prioritizing, and implementing projects. We have engaged a wide range of stakeholders from sectors targeted for recovery. The represent a spectrum of government and local/regional private sectors, as well as community-based and non-profit organizations. Stakeholder engagement meetings were conducted in Spring and Summer 2018. The outcomes of these sessions are now informing the Recovery Goals for the regional framework and will feed into subsequent planning sessions and RSF workshops. Laura Hanson, RDPO, serves as Project Manager. Stakeholders participate in workshops to develop the framework collaboratively. If you would like to attend a future workshop, contact Laura Hanson to be added to the stakeholder email list.